In a blender, chop garlic, basil and sun-dried tomatoes. Put aside. In a wide pot combine sausage and one cup water and cook until sausage is cooked and separated. Add blended tomatoes, garlic and basil and cook until it is mixed together. Slowly add cream. When all is warm, add cheese and stir until it too is blended. Add Pignolia nuts. 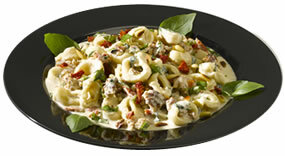 Cook Tortellini and pour sauce over and mix into pasta. Garnish with fresh basil. Preheat oven to 450 degrees. Wrap 5 cloves of garlic in aluminum foil and roast for about 20 minutes or until soft. Squeeze garlic cloves to extract soft centers into a small saucepan or bowl. Cook P&S Linguini as directed. In a bowl of warm water, add chopped dried figs. Allow to soak 10-20 minutes, until soft. Drain liquid. Juice one lemon, removing seeds. 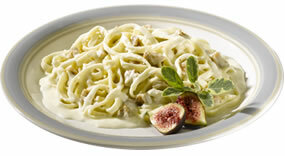 In a small saucepan add one cup of P&S Alfredo Sauce, soft fig pieces, and roasted garlic pulp and lemon juice. Mix well to combine. Cook over low heat until sauce is warmed, stirring frequently. 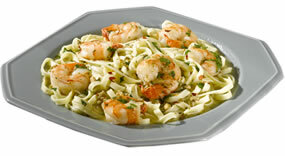 Serve warm over P&S Linguine pasta. Wash and drain the spinach do not dry completely. The water that clings to the leaves will steam the spinach as it cooks. Cook olive oil and bacon in a large fry pan over medium heat, add garlic. Sauté until garlic becomes pale gold. Wilt spinach one handful at a time. Stir, add butter if desired. Add salt and pepper to taste. Remove from heat and plate the spinach. 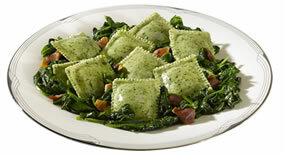 Drain the Ravioli and add to spinach on the plate. Sprinkle with P&S Grated Pecorino Romano Cheese. Serve and enjoy! Prepare your favorite tomato sauce prior to making the tuna balls, so that your sauce has a chance to simmer for at least an hour. Thoroughly mix tuna. 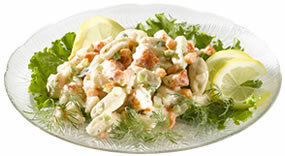 , egg, bread crumbs, parsley, salt, pepper and garlic powder until firm. Roll tuna balls and fry in olive oil until all sides have browned. Drain and place tuna balls in sauce. Cook for an additional hour, stirring occasionally. Prepare Fettuccelle as directed. 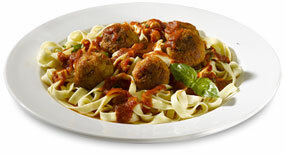 When cooked, draw and pour sauce and tuna balls over pasta. Sprinkle with P&S Grated Locatelli Cheese. Garnish with fresh basil and serve. Pre-heat grill to high, then adjust to medium before adding vegetables. Combine onion rings and garlic cloves in a bowl, drizzle with 1 tbsp. olive oil, sprinkle with salt and pepper. Transfer to grill vegetable basket. Grill 5 minutes, stir and continue cooking another 5 minutes until slightly browned and onions are transparent. Remove onions and garlic from grill, transfer to small saucepan. Add canned tomatoes with sweet onion (undrained). Cook on high until boiling, then lower heat to medium-low to allow liquid to reduce, about 7-10 minutes. Chop tarragon and add to pan after removing sauce from heat. Stir. Place asparagus cuts into a bowl; add 1 tbsp. olive oil, stirring to coat. Sprinkle with salt and pepper. Grill asparagus over medium heat for 5 minutes, stir. Continue cooking 5-10 minutes until tender. Drain Ravioli when cooked. 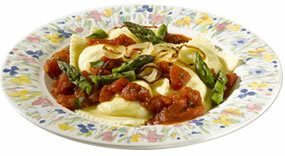 Add tomato sauce to the bowl, top with grilled asparagus cuts. Sprinkle with P&S Grated Pecorino Romano cheese. Serve immediately. Heat the oil and garlic over low heat in a heavy saucepan until the garlic turns opaque (this should take about 10 minutes). Note: Tilt the saucepan so garlic is covered in oil and is simmering to prevent browning. Take garlic out of saucepan and set aside. Begin boiling water and prepare P&S Spaghetti following directions on package – be sure to use at least a tbsp. of salt in water. 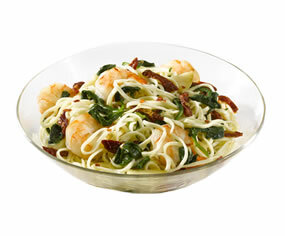 Sauté red pepper flakes, sun-dried tomatoes and spinach in mild olive oil for 2-3 minutes at low-medium heat. Add butter, shrimp and garlic and continue simmering an additional 2-3 minutes. Drain the pasta and combine the shrimp and sauce in the pot that you cooked the pasta in and toss until all the Spaghetti is coated. 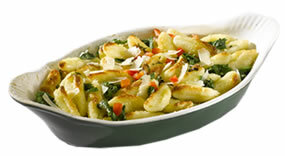 Serve onto warmed plates and top with P&S Grated Locatelli Cheese. Add salt and pepper to season. 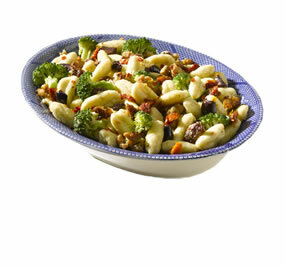 Cook P&S Cavatelli in boiling salted water –drain over cold water and set aside. Add celery, carrots and onion. Incorporate mayo – enough to coat pasta. Add dry seasonings, mustard and hot sauce. Mix together. Now add the chopped crabmeat. Top with red wine dressing to your taste. Mix and let sit in fridge for a few hours, or overnight. Moto bene – Enjoy! Add 2 tsp. olive oil and 1 tsp. salt to 4 qt. boiling water. Add P&S Fettuccelle; return to boil. Boil for 3 minutes. Strain pasta. Set aside 1/8 cup pasta water. Rinse pasta lightly with cold water. Lower heat to medium. Add 1/2 cup olive oil to pot. Return pasta to pot. Add 1 lb. chopped fresh spinach. Add 1 cup P&S Grated Parmigiana Cheese. 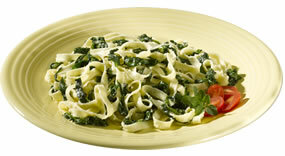 Toss until pasta is covered with cheese, oil and spinach. Add 1/8 cup pasta water. Add 1/8 cup white wine. Stir, and then cook on medium heat with lid 4-5 minutes. Garnish with fresh oregano and grape tomatoes. Serve. In large skillet, combine oil and butter. When hot, add minced garlic, parsley and red pepper seed. Sauté for a minute or so. Add shrimp, sauté until pink. Add clam juice and wine. Cook at a simmer for 10 minutes. Add salt to taste. Toss with P&S Linguini. Enjoy! Cook P&S Gnocchi according to package, reserving one cup cooking liquid. In large pot, sauté garlic in olive oil. Add sun-dried tomatoes, olives and anchovy paste. Add cooked, browned sausage and cooking liquid from Gnocchi. Add drained Gnocchi and broccoli florets and heat through. Add cheese, salt and pepper just before serving, passing additional cheese at the table. Fry bacon until crispy, drain and set aside. Sauté spinach in bacon oil and garlic for 2-3 minutes. Add crumbled bacon to the spinach. Cook P&S Ravioli according to package and drain. 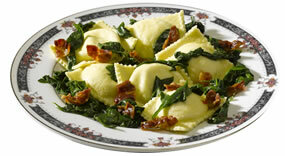 Place Ravioli in bowl, mix in spinach and bacon. Sprinkle with P&S Grated Parmigianino Cheese and serve. A perfect meal for a busy family. Heat oven to 325 degrees. Cook P&S Cavatelli 5 minutes in boiling water. Drain – save 1 tbsp. water from Cavatelli. In oven-safe dish, heat butter. Toss drained P&S Cavatelli in dish. Add parsley, water and P&S Locatelli Cheese, bake for 5 minutes. Before serving, add a few sprigs of arugula. Enjoy!